The Rock of Gibraltar always appears dramatically by land, sea and air for first time visitors.....the sharp turn of the passenger aircraft bringing to view its western slopes and upper town area is breathtaking and exhilarating as the wings dip into a sharp turn before landing on its small runway. The Rock getting larger as you sail into port from either the Atlantic or the Mediterranean is truly unforgettable. It is easy to see why this is such an important military and tourist port. By road, the huge limestone rock will always impress you as you turn a corner and see it up close for the first time. The 22p stamp features a misty view up towards the old town with the Moorish Castle in view. Built in the 8th Century it has withstood the Rock’s turbulent history to become one of Gibraltar’s main tourist attractions. This is the view cruise liner passengers have as they walk into town heading for Main Street and all its shops, restaurants and cafes. 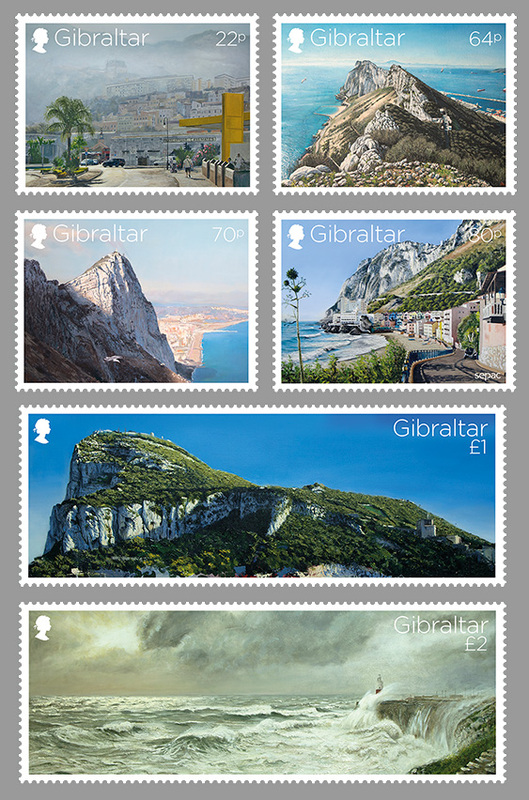 The 64p stamp features a view towards the south that catches the eastern slopes on the left with the recognisable beaches at the bottom and the Bay of Gibraltar on the right with the continent of Africa directly south in distance. The 70p stamp depicts a view of the eastern side towards Spain - the impressive Mediterranean Steps walk gives you this viewpoint as you walk along paths and steep steps on the eastern side up and over to the western side of the Rock. The 80p stamp features Catalan Bay ‘La Caleta’, a very popular beach for locals and visitors alike. Catalan Bay was populated by Genoese fishermen during the 17th and 18th centuries although there is debate whether it was actually named after Catalan settlers, amongst the first inhabitants of Catalan Bay were Catalans, despite being outnumbered by the Genoese. The £1 stamp features the western side of the Rock. This is the view you get when travelling by land from Spain. The castle is visible along with the openings on the Rock, historians amongst you will know, are part of the Great Siege Tunnels. The £2 stamp features the Trinity Lighthouse at Europa Point in stormy weather, always a sight to behold as the sea rages and crashes against the cliffs during storms coming in from the Atlantic or strong easterly winds. The lighthouse rises about 49m above sea level and started operating on the 1 August 1841. It is operated by Trinity House, the General Lighthouse Authority for England, Wales, the Channel Islands and Gibraltar.